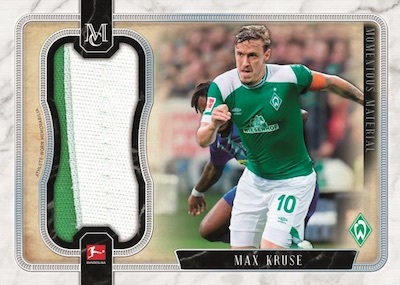 Ramping up coverage for the German soccer league, 2018-19 Topps Museum Collection Bundesliga applies the popular MC look to DFL stars for the first time. Each box of the Hobby-only release features three hits, including one autograph, one autograph relic, and one relic. 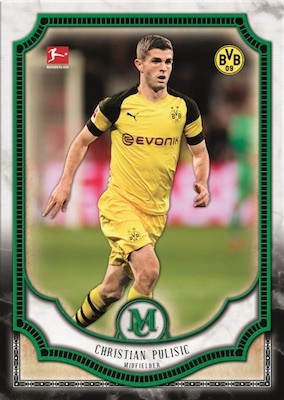 Collectors can find a chromium soccer set for the '18-19 season via 2018-19 Topps Chrome Bundelisga. Many of the top players appear in the 90-card base set. 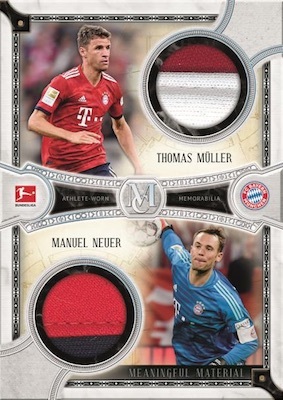 2018-19 Topps Museum Collection Bundesliga also has Gold (#/50), Ruby (#/25) and Emerald (1/1) parallels, which average one per box. 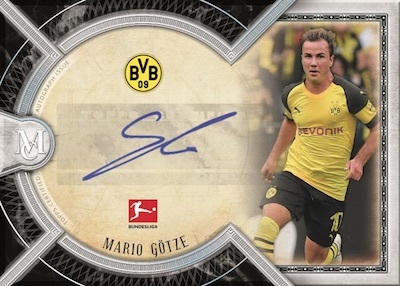 Moving to the hits, the 2018-19 Topps Museum Collection Bundesliga checklist provides limited autographs at a rate of one per box. Numbered to 99 or less, the Archival Autographs line adds Sapphire (#/75), Gold (#/50), Ruby (#/25) and Emerald (1/1) parallels. There are also Archival Dual Autographs (#/25) with one-of-one Emerald editions. 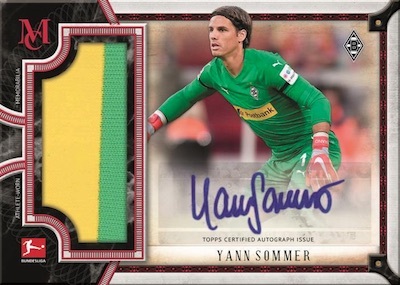 Falling one per case, the Framed Autographs set promises "the biggest Bundesliga autograph signers of the checklist." These have Ruby (#/25) and Emerald (1/1) parallels. 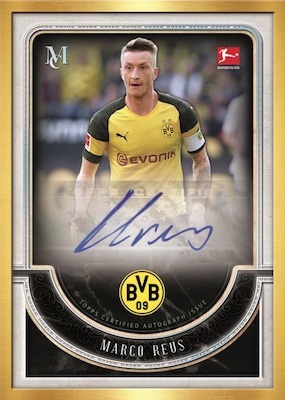 Providing something extra to go with the signature, each 2018-19 Topps Museum Collection Bundesliga box also houses one autographed relic. Choices include Museum Autograph Relics (#/99 or less) with Sapphire (#/75), Gold (#/50), Ruby (#/25) and Emerald (1/1) parallels. The Autograph Jumbo Relics (#/99 or less) cards feature an oversized vertical swatch alongside Gold (#/50), Ruby (#/25) and Emerald team logo patch (1/1) parallels. That leaves the one-of-one Museum Framed Autograph Patch cards as the key chase. Unsigned relics round out the hits with one per box, as well. The Meaningful Material Single Relics (#/99 or less), Momentous Material Jumbo Relics (#/99 or less) and Single Player Triple Relics (#/75) sets each have Sapphire (#/75), Gold (#/50), Ruby (#/25) and Emerald (1/1) parallels. In addition, the Momentous Material Prime Patch Relics cards increase the relic quality and decrease the print run to just 10 copies, while the numbered Dual Meaningful Material Patch Relics insert highlights two players.